Daniel earned 1,500 points on the CLEVELAND/SRIXON ORDER OF MERIT, earning his second win on the VGT this year, and moving him into the top 10 of this year’s Order of Merit. Meanwhile, Parry kept himself separated from his next challenger, Ryan Williams as they both earned 933 points on the day and $1,200 cheques. Parry’s year-long point total is at 10,336 while Williams catapulted himself into second place ahead of Abbotsford’s Nick Taylor with 6,807 points. Taylor sits alone in 3rd with 6,455 points after a disappointing round of 73 today. Williams will be looking to gain a bit more ground on Parry next weekend at the Golden Ear’s Open at Pitt Meadows Golf Club while Taylor will be flying out into Ancaster, Ontario on Saturday area where he will qualifying at Heron Point Golf Links for chance and join Adam Hadwin in the RBC Canadian Open at Hamilton Golf Club. Hadwin, a WEB.COM regular, fired a solid round of four under par 66 to share a tie for 5th place with Canadian Tour Pro Matt Makinson and a cheque for $716.67. Hadwin will also be flying out east to prepare for the Canadian Open, where he will look to re-create the magic we so fondly remember from the 2011 RBC Canadian Open at Shaughnessy where he finished t4th overall. 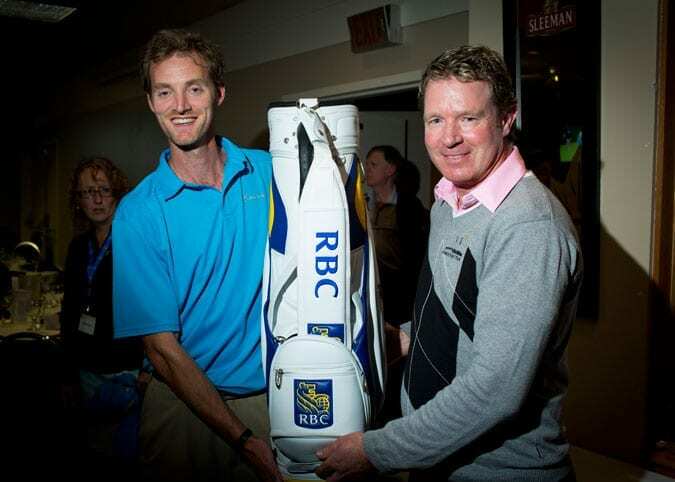 This year’s RBC DS Charity Pro-am directly benefits Canucks Place Children’s Hospice in Abbotsford. The event has raised over $80,000 the past 2 years, and according to RBC representative Ray Mohan, “the event looks to raise its highest amount for the charity to date”! “It’s a great partnership we’ve established with the VGT, and our clients and partners have really enjoyed the day on course with some of BC’s up-and-coming stars in the game of golf”. “We are happy to promote the VGT with our sponsorship of the event, and it’s great to see so many low scores by the top players today”. VGT Commissioner Fraser Mulholland echoed Mohan’s words, “We are extremely fortunate to be in partnership with such a credible company as RBC. The event gives our local players, many of whom are doing so well out on the Canadian Tour, a place to come home and play, and win some serious money for an 18 hole event”. We are proud to be a part of any event that can have such a strong fundraising component for charity, and Canuck’s Place is such a great Charity, that we couldn’t be happier to be involved through making the day just a bit more exciting for RBC’s clients to play with such talented pros with our Live Leaderboard experience”! For an update of the CLEVELAND/SRIXON VGT Order of Merit Leaders, please CLICK HERE. For complete final scores, please CLICK HERE. Fraser Mulholland, President & Commissioner. Fraser is the prime visionary behind the Vancouver Golf Tour and currently acts as Commissioner of the Vancouver Golf Tour. He is passionate about the game and has a strong desire to develop the young talent in this province. He is responsible for leading a multi-disciplinary team of professionals to make this vision happen. A PGA member of Canada since 1992, Fraser has accumulated over 20 years of experience in golf instruction, tournament play and golf course & tournament operations. In this same time, Fraser has become one of the most accomplished professional golfers in BC and in Canada, winning 34 professional tournaments, qualifying for the South African and Australian Opens and twice playing on the PGA Tour. Through his golf tournament travel experiences, Fraser has implemented similar tournament models for VGT that have made the top international golf bodies so successful.